A PDF version of this article appears in the October 7, 2016 issue of Executive Intelligence Review and is re-published here with permission. 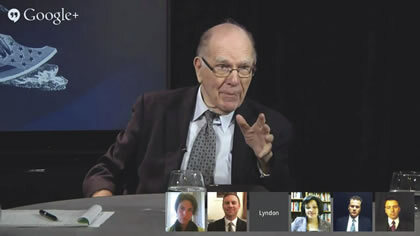 In a discussion with leaders of his association on Sept. 30, Lyndon LaRouche was single-minded and unflinching in his insistence that the crucial strategic issue today is the development of the human mind—and how that may be accomplished. Edited excerpts follow. Lyndon LaRouche: Among the things that we have discussed in the preceding report today and earlier, there are some things that we have missed and which most people in our own organization rarely understand. The question in terms of economy involves not simply products capable of measurement as such, but rather involves the requirement of developing human minds in new ways that the human mind has even fashioned to do it. In other words, these are problems involved which cannot be explained; they have to be created. And without that, what we are trying to do here would be a failure, because the problem of mankind mainly is not what is complained about in usual political luster. What is important is what makes human minds work. And there is very little attention to that question. There are certain things which are important, but the important thing now is we have to change the character of the craft of things. We are going to change things from what was being done up to now. And we are going to make a new start on the basis of understanding what are those principles—principles which almost no human being knows—and those principles which have to be included which have not been included up to the present time must be introduced. Otherwise, the attempt we are making will fail. And that, I think, is something we should probably take up right now. I think Jeff wants to talk about it as well. Let’s continue from there. Jeffrey Steinberg: I think that issue is obviously begged by the crisis moment that we have reached right now, in which the existing trajectory and directionality of things is doomed to fail. I think there are three situations that beg that issue, and put the question of a completely different approach and paradigm of thinking, starting from exactly that standpoint, of what is the nature of man and the question of how to create a system that drives this sort of human creativity. So they are basically saying we are potentially moments away from the entire financial system blowing out, and that there are many trigger spots in Europe, the lead one being obviously Deutsche Bank. They say that Merkel’s continuing public insistence against any kind of intervention that would prevent the system from blowing out, is one of the greatest dangers at the moment. That’s one issue, which is the imminent blowout and the unwillingness to take a creative approach. LaRouche: But the most important thing, Jeff, is not what you just attested. What is important, which is little known today, is what is the power to create new sciences, new kinds of science, to bring the whole system of humanity into a functional form. Doing what you are talking about so far would not work. Therefore, that is what I’m emphasizing, that this would be an amateur night. It would be a nice amateur night, but it would be in effect an amateur night. Because mankind has not discovered the meaning of mankind. People want to talk about gimmicks, they want to talk about skills; those things are necessary in their own way, but they are not the creative force on which the existence of humanity depends. We have to mention that. Don’t be practical. Stop being practical. Practical people are dead people. What we have to do is develop the question of scientific thinking. For example, we have in the ocean and other places, areas which have a development process, almost like planets and so forth, and we have to change the character of everything in the universe. It has to be changed in one way or the other. That understanding is what has been destroyed! That is what has caused the fall. That is what has caused the crime—being practical, and as long as you operate on the basis of a practical system you will get a practical bunch of thieves, largely, and you will not understand what mankind’s future is. And we have got to bring the question of what mankind’s future is, what is mankind going to do that changes everything from what mankind has been doing up to now. Diane Sare asks LaRouche if the optimism and future orientation of former Israeli Prime Minister Shimon Peres, recently deceased, is something we might want to address. LaRouche: No. The important thing is the kind of thing that has not been understood heretofore. That is, technologies, approaches, space programs. The problem here is that people do not understand—most people on this planet do not understand—what that problem is, the problem of science, of real science, not of science as a copy of this, a copy of that, or something simple like that. This is what we have to do now; otherwise mankind cannot continue successfully the mission we just talked about. The mission is there, but the question is, what is the instrument which will make it work. And what we have discussed so far does not answer that problem. In other words, all the things people suggest now, usually, in terms of recommendations, won’t work, not for this purpose. You have got to recognize that the degeneration of the human mind, which has been induced over centuries, the degeneration of the human mind in most of the population of the world—that is the thing that prevents mankind from doing what we were talking about this morning. And we’ve got to change the subject. Don’t get on that subject. We said that now. We are going to say it. But now we have to put in something else without which we will not succeed. Sare reports that that night, John Sigerson will conduct the first seminar on the question of the scientific, Verdi tuning for the musicians and others who had participated in the series of performances of Mozart’s Requiem, as an escalation in developing their understanding of what is unique about our approach to the music, as opposed to the garbage and degeneration that typifies the New York music scene. LaRouche: I’ll make two points on this. First of all, what John will do, because I know John, and I know how his mind works, at least fairly well, I don’t know everything that goes on in his mind, but I do know him and I’ve worked with him and we’ve worked together. The idea of classical music composition the way John would deal with it, when presented, represents one part, a very significant part, but a peculiar part of what we have to do to create a discovery of the ability of the human population to actually be successful. Now the issue here is being successful. Not successful in getting money or this or that, but successful in achieving what has never been done before! And John is in a category of those who can comment on that and develop that idea in very important aspects quite readily. I would point out the importance of his work on that account. But the point is, don’t try to give a simplification. I’m talking about something that most of you here don’t know yet. What I’m talking about is what you don’t know. And that is what has to be delivered. You will get it on islands, for example, or the Moon, or the [Moon’s dark side]. You’ll find out that things are there which force mankind to consider new things which have to be done. But the usual thing of practical development of economy will not work. The population is not ready to handle it. Steinberg: You mentioned yesterday, Lyn, that you had some thoughts on reviving a lot of the basement work . . .
LaRouche: No, I’m not. I’m talking about science, not basement. Most people don’t know it. We have some people who have the elements of the ability—like John’s case. John Sigerson has a plan. I understand what the plan is. I don’t know the details of what he knows, but I know John. I know his mind, and that’s important. It contains something which is unique. It is not something you can copy. And the same thing is true of everything else. The broad length is we are going to have to explore space. We are going to largely explore space. It is one of the most important issues to be taken up immediately! Don’t get into something else and say this will do it, that will do it. It will not do it. The point is that mankind has been stupefied by its economy, its economies, its cultures, the cultures and forms of skills of mankind have been largely stupid, stupidity of one kind or another. Now the time has come when we have to approach not only the immediate things we can point out, but we’ve got to concentrate on real science, not what is called science, but real science. Without real science we cannot make it. Benjamin Deniston: I think one of the frontiers is the galactic perspective . . .
LaRouche: Of course! The inability to present a competent study of what the galactic system means—when you include some of the space program objectives—there you begin to get into science. You get into science then and only then, and into the real sociology of the human mind. And that is what we’ve got to do now. We cannot go back to some new version of an old thing. We have to realize that what has been done in the past by some of the greatest minds, that have been rare minds, have developed this kind of process. Understanding the galactic system: “there you begin to get into science.” Here, our Galaxy, the Milky Way, as we see it from our place in the galactic disk. The practical man—most people are practical men and women—is not scientific in terms of any real science. They call themselves scientists because they have a scientific label. But they are not really scientists. Einstein was a scientist, and Einstein knew that you cannot have a mathematical conclusion. And that is an example of what the problem is. Einstein did not ever make himself a practical man. He investigated the effect—what the role of mankind is in space, in the universe. A lot of people who admire Einstein don’t know that. They think they’ve got some practical thing they can use. It doesn’t work. But if you look at it from the Einstein side, the actual Einstein side, you are getting into the right area. You’re going to move planets! You’re going to move everything! You’re going to have to change the rules of planetary existence. These things have to be done quickly. We can improvise for a short period of time, but the foundation of our campaign has to be more profound. Deniston: I really think this Einstein reference that you have developed, or the Einstein principle, really, is critical, because if you are talking about the Galaxy or really understanding the Solar system, it’s an issue of new principles. It’s not just derivations or descriptions . . .
LaRouche: Exactly! You’ve got it! It’s what we’ve learned from Einstein: After what we think we’ve learned from his experimental work, we find out there’s another layer beyond that, and that is the discovery of what the meaning of science is. And Einstein was unique in that respect. Many people thought they had understood Einstein on the basis of this or that theory, but that’s an amateur issue. The more profound thing—and the aspect of Einstein that is more profound than practically anybody else who’s working in science—is to understand this: You have to understand that what mankind has to change, are the principles of science, the principles of the practice of science, from a Solar way. And that is what mankind is going to rely upon to save our civilization from what we are trying to fight against now. We’ve got to educate mankind in a more profound way than most people have imagined. And you’re going to have to educate them, and you’re going to have to find ways to do it. I think as a case in space managed under China, under China’s science, that would be a good starting point. Kesha Rogers: What came to mind is the question of the mind of Einstein, or take Krafft Ehricke, as living in the future. I was reminded of Ehricke’s 1966 article, in which he wrote as if he were in 2001, looking back on 1966—the question of space travel and development of space from the standpoint of living in that future that you are already hoping to create, that you are already destined to create. Not just going from some kind of bottom-up perspective, but starting from what is man’s rightful place in the Universe, what is man’s rightful place in the Galaxy. That is the way China is thinking. They have already committed themselves to that higher identity of mankind—not just going to the Moon and then taking the next step and traveling out into space. They have already defined what the potential of mankind is in terms of our destiny and our role in developing and conquering space in the way that Krafft Ehricke understood. LaRouche: Exactly! Exactly so! And this is the same thing as his science prospect. Everything that we need as human beings, everything we need is exactly what I’m talking about. Don’t try to change it back to something more conventional. You just screw things up. What we have to do now is something previously considered impossible. The most advanced work of Einstein, which is not what many people think, as a practical thing, but what Einstein did with his mind was precisely in that direction, of how mankind can develop mankind. What we’re talking about in this whole issue here, if you want to develop mankind, you’ve got to go by the right rules, and you cannot do it by practical methods. We can do it. We can do it right now under these conditions. We can do it in certain parts of the world. We’ve got to do it. But we’ve got to be discretionary. Don’t be practical! It will make you all fools, as before. Anyway, that’s my point, and I think that is a concluding point on the argument of principle, and I think anything else would be a fallacy in practice, under these kinds of conditions. We want to get out of this, what the past has done to us; we’ve got to go by the path of the future. Rogers: I think it is beautiful, because you always find that the enemy of mankind tries to set the terms of what is allowed, or what is going to be the determining factor in the discussion. Instead of playing by what they say, we must outflank them with something more profound, a higher conception. What you just presented is a real flank against the enemy, the enemy of the creative process, whose real target is the creative identity of the human mind. We are looking at devastation in the world now—the murders, the war threat, the attacks against China, the fact that we are at the brink of total annihilation—so you start to think about how you address those things from a lower level. But what you just presented is that they are out to destroy the souls and the minds of the human species, and if you want to take them on on that, there is no other approach than what you have just presented. Steinberg: It reminds me that when Deng Xiaoping came to power in the late seventies, early eighties, he said don’t give me any titles, don’t give me any mundane responsibilities. My first priority is building up the scientific capacity of China. He said if we can focus and concentrate our effort on reviving science and training a generation of new scientists and engineers who think that way, then China will emerge in thirty years as a great nation, leading the world in this area. LaRouche: That has the smack of being practical, but I don’t think so. What I am thinking about is something much more important. The point is you’ve got to get at this and realize you’ve got to revolutionize the idea of science, not revolutionize this or that. You’ve got to emphasize the revolution of the idea of science. That’s where we’ve lost. That’s where the United States, Europe, and so forth have lost. There are some parts of the world where we have just had an example of this, of studying things of a higher order. But practical things, or things which have a practical nature, will not get us out of what we’ve been into recently. It will fail, as mankind’s practice has failed before, because that science does not really understand science. So why don’t we just go on and get into this science business. Present the question of what are the issues of a higher science for mankind now! That is what you’ve got to concentrate on. Don’t think about knicks and knacks. You’ve got to make a revolution in technology, right now. That means scientific technology, not practical technology. After interrupting an intelligence briefing, LaRouche returns to his main theme. LaRouche: China has been developing a program to study the far side of the Moon. It is something which has been done before in a certain way, but it is very important. This aspect of exploration is probably the best spiritual source to get people to understand what these methods are. Don’t try to say you are going to discover the method. You’ve got to say what they are, what do they do. You look into space, and find we have a situation where we do have a Moon, which we don’t know yet how to deal with entirely, a large Moon, and it is that kind of mentality which has to be focussed on, and it has to be specified on that basis. Not something like, well maybe we can get there. We have got to get there now. This is the kind of thing that can enable us to move the population into new areas, the kind of new areas where they will discover the ability to think. Right now most people in society do not have the power to think. Not really. The human being is capable of thinking, but you’ve got to make it happen. LaRouche again interrupts an intelligence update, and continues. This does not go the point I am raising. What I’m saying now is generally not understood by most people. 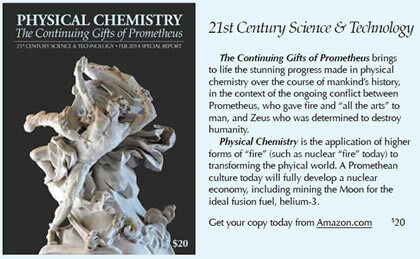 The question is, what is the existing scientific potential on which the future of mankind depends, not some gimmick. We’ve got to educate the people, young people, we’ve got to train them. We’ve got to do all the kinds of things which will tease the imagination of the young student. That is the way, by feeding that question, as I know from my experience. That question is the way you get to real science. And you get into the kind of things that allow us to get back to what we’ve lost, over the lifespan of most people on the planet. They’ve lost it! We’ve got to give them back the means of regaining what they’ve lost. Otherwise the whole thing will fail. We want science! We want absolute science! We want space science. We want the kinds of things that grab the imagination and produce the people who become recruited to that kind of work. Without that we lose. Remember how bad this planet has been in terms of its behavior. Just think of every part of the planet—nation after nation after nation. What have you got? You’ve got some people who have good intentions. You’ve got some people who achieve things. But in main, the human species has failed. And we’ve got to do something about that right now, or begin right from there. I think we can explore the Moon, which is what China is doing. That would be a good starting point, to get at what is the problem and how do we approach it.